Kata'ib Hezbollah (Hezbollah Battalions) is among the most well-known Iraqi groups backed by Iran. It has participated in the war in Syria in support of the Syrian government. Less widely known is the group's recruitment of Syrians. Today's interviewee is a member of Kata'ib Hezbollah's Syrian wing. He is originally from the Shi'i village of al-Fu'a in Idlib, which, along with Kafariya (another Shi'i village in Idlib), was completely evacuated of its original inhabitants earlier this year. Prior to joining Kata'ib Hezbollah's Syrian wing, he was in the Hezbollah-affiliated Special Force. This interview was conducted today. Any parenthetical insertions are in square brackets. Q: First can you tell me a little about your life? You are from al-Fu'a right? When did you leave al-Fu'a? A: Yes I am from al-Fu'a. But I was not besieged. I left exile. And I came 4 years ago fighting to break the siege of our people, but my family and relatives were besieged. Q: I see. So you came from al-Fu'a to al-Sham? And immediately you joined Kata'ib Hezbollah? A: No. I was in Lebanon. I came to al-Sham [Damascus]. I joined the Special Force and did a special course in Lebanon. And I came to al-Sham. Later the Kata'ib Hezbollah formation- Syria front was established to break the siege. And I joined the formation. Q: I see. So roughly when did you join Kata'ib Hezbollah? A: Around 3 years ago. Q: And in which areas have you fought within its ranks? A: Aleppo, Deir al-Zor, Albukamal: such that we reached the city of al-Qa'im in Iraq. And previously Idlib, Zabadani and al-Ghouta. I fought in those places. Q: Many battles by God. And when you were in the Special Force in which areas did you fight? Q: Yes. Is there a special Syrian wing for Kata'ib Hezbollah? I mean a formation particular to Syrians in the battalions [Kata'ib Hezbollah- and hence all references in this interview to 'the battalions']? A: Yes, it exists. And I am presently in it. Q: Does it have a special name? Or there is no name particular to it? A: Fifth Regiment: Kata'ib Hezbollah- Syria front. Q: Yes. Why did you choose to join Kata'ib Hezbollah after the Special Force? Did you have friends in the battalions? A: I chose the battalions because a formation was established to break the siege of our people in al-Fu'a and Kafariya. Before it was set up, there was no formation. I have friends [in Kata'ib Hezbollah]. Q: Yes. 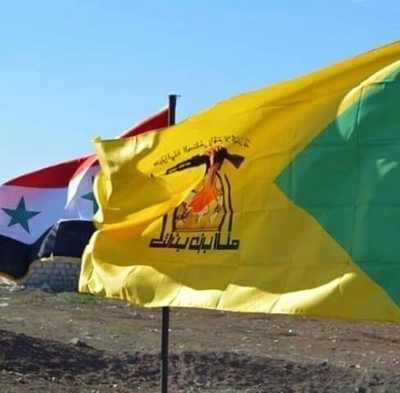 So this formation in Kata'ib Hezbollah that is particular to Syrians was established to break the siege of the people of al-Fu'a and Kafariya. Correct? Q: The Syrian formation for the battalions is on the registers of the Fourth Division currently? The reason for the question is that the Syrian wing of al-Nujaba' was registered on the registers of the Fourth Division for salaries. A: Brother, clarify your question more. Nujaba' is one formation, and we are a formation. Regarding the battalions, there has been registration with the Syrian state. This is what I know. Q: I mean the fighters of the Syrian wing for Harakat al-Nujaba' were registered on the registers of the Fourth Division for taswiya' [regularizing one's status] and salaries. A: I am [of] Kata'ib Hezbollah, and not from al-Nujaba'. There is a difference. Q: So you are not on the registers of a specific Syrian formation like the Fourth Division? But you receive salaries from the Syrian state? A: A salary from the state we have not yet received. And all that concerns salaries and these matters: Iran is the first one responsible for all formations in Syria: Lebanese, Syrian and Iraqi. Have you understood me, brother Aymenn? Q: So you mean that the salaries are distributed through the Syrian state but the financing is from the Iranian side, right? A: I don't know exactly. But as for us, we receive through a Syrian bank, and a portion of the salary comes to us from Iraq. Q: Yes. How many martyrs does the Syrian wing of Kata'ib Hezbollah have? A: Eight martyrs in the Albukamal battle, and around seven wounded. Two of my friends lost one of the two eyes. Q: Currently you are performing ribat [manning frontlines/maintaining watch] on the Albukamal front? A: Yes, some in Albukamal, and some in al-Ghouta. Q: Al-Ghouta? But al-Ghouta was entirely liberated, right? A: Yes of course. But there have remained pockets of Da'esh [Islamic State],* but the operations have stopped. Q: My last question for you. Of course in the end Idlib must be entirely liberated. Do you expect that it is possible for co-existence to return like before the events? A: Regarding Idlib, there are operations [planned], but the matter depends on Turkey, Russia and Iran. They are the ones who decide, and Idlib- God willing- will return, and co-existence, I don't think [that it is possible]. For me, my blood boils regarding Idlib, because of what they did to al-Fu'a and Kafariya. Q: Yes, by God. So blood has arisen between you and them. A: Yes, exactly. But we have mercy from God. But there is hatred, and God is the One who knows of everything. *- Clearly referring to possible insurgent remnants that may cause trouble in the aftermath of the Syrian government's recapture of the area.